Manchester United‘s topsy-turvy summer transfer window isn’t letting up any time soon. The team has already signed three players in Lee Grant, Diogo Dalot, and Fred, but manager Jose Mourinho has made it clear that he isn’t quite done yet. In a scathing press conference in USA, the Portuguese boss highlighted that he sent in a request for five players to be brought into the club, but hasn’t been offered anything just yet. But he may have more problems in his own squad as it turns out. United winger Anthony Martial has made his feelings public about the lack of playing time at the club, and has also signaled that he is ready to move on. Though it was obvious that he wasn’t first choice for his manager last season, Mourinho has nonetheless denied a transfer request for the most part, and has slapped a heavy price tag on the youngster to scare off any suitors. But in recent days, it seems as if Mourinho’s patience with Martial has run out. The Frenchman joined the squad late a few days ago, after leaving the pre-season tour for the birth of his son. He has reportedly been difficult to work with as well, perhaps stemming from his frustration of still being with the Reds despite making his concerns known. Mirror now claim that Mourinho has had enough of the 22-year-old, and is willing to do business with other clubs. One such club could be title rivals Chelsea, with new boss Maurizio Sarri keen on bringing Martial in, but would have do away with his own winger in Willian, to fix up a deal. 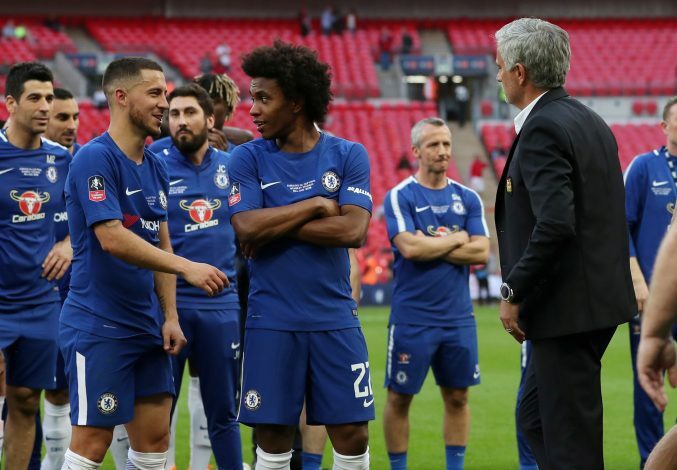 Willian, at 29 years of age, is very much the senior, but Mourinho knows what the Brazilian is capable of, after bringing him to England in the first place. And while United officials are hesitant on letting Martial go, they will be aware that a swap deal might just be in their favour after all.